Pakistan holds an Agro-based economy. The importance of the agriculture sector in the economy of Pakistan can be viewed from the factor that it contributes 21% to the gross domestic product of the country and provides job opportunities for 55% of the labor force. It also accounts for 80% of the total export earnings of the country. In Pakistan, agriculture is playing vital role in ensuring the food security, reducing poverty and improving the economic growth. Pakistan indeed has a tremendous potential for agriculture, simultaneously, it is gifted with a weather pattern that is suitable for almost all types of production. 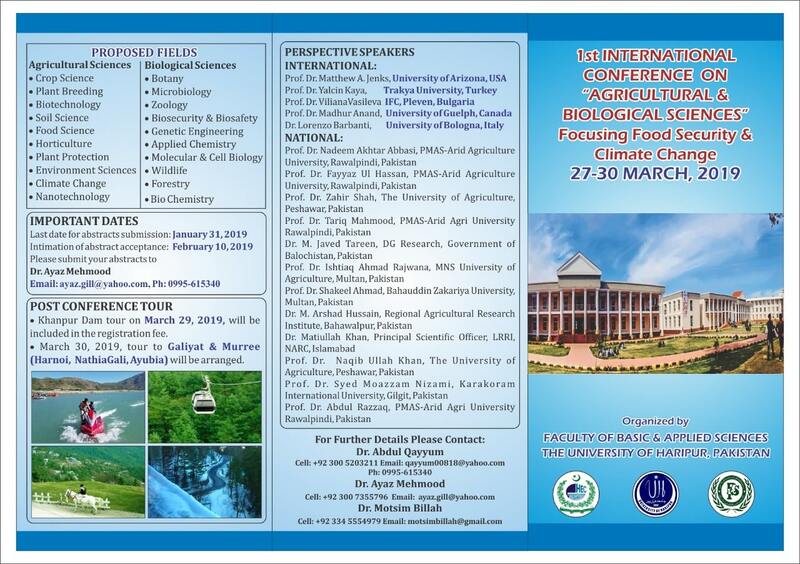 In order to analyze challenges and opportunities to boost agriculture in changing climate we are going to organize a four day 1st International Conference entitled “AGRICULTURAL AND BIOLOGICAL SCIENCES” Focusing Food Security and Climate Change during 27-30 March, 2019 at The University of Haripur, Haripur, Khyber Pakhtunkhwa, Pakistan. 1. The whole title of the paper should be CAPITALIZED. 2. The authors full name should always begin with the first name. Put an asterisk after the name of the author who will present the paper. 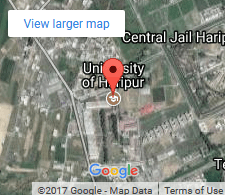 The complete office/institution address of the researchers should be indicated corresponding to the person and address. 3. The text should start on the next line, 10pt Arial. Poster paper maybe preliminary report of an ongoing research/study or a completed research report. The poster should be well organized, concise self-explanatory and should be 36″ × 30″ portrait with the following information: title, authors names, address (unabbreviated), brief introduction, objectives, methodology, results and conclusion. One of the authors should be present during the Poster Session. All the stakeholders (Academia, researcher, students and farmer) will be provided an opportunity to interact with agri-tech industry and industrial products. Event will provide an excellent opportunity for agri industrial sector to exhibit their products for marketing. All the presented stalls will be evaluated and best three stalls will be awarded with shield. Certificate of participation will be awarded to all the agricultural industrial representatives. Interested industries can contact to Dr. Waseem Ahmed for registration. 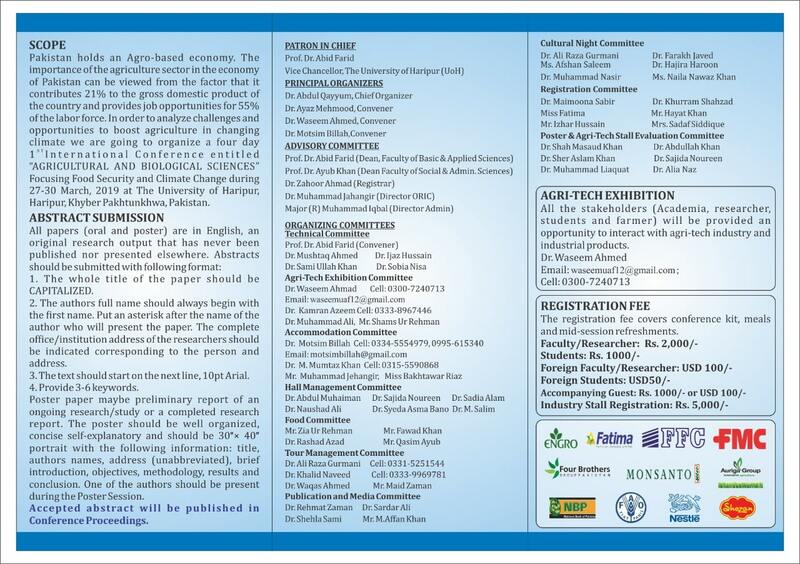 All the participant of the conference needs to register as per the detail given below. The registration fee covers conference kit, meals and mid-session refreshments. Khanpur Dam tour on March 29, 2019, will be included in the registration fee. March 30, 2019, tour to Galiyat (Harnoi, Nathia Gali, Ayubia) will be arranged.